SBI Recruitment Tests,IBPS,Postal,Insurance and other State level Competitive exams).General Awareness Section consists of Questions on G.K.(General Knowledge) and Current Affairs.This section plays an important role in scoring. 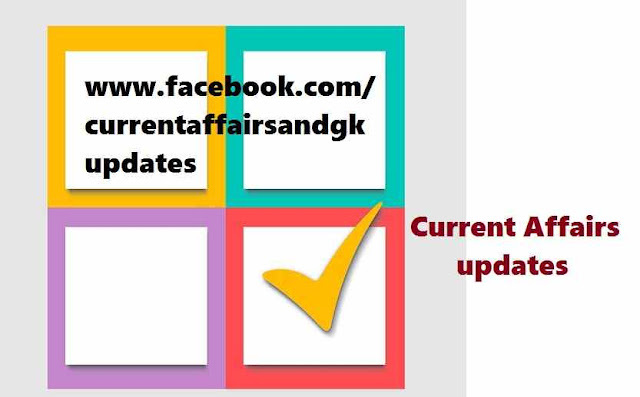 Updates till 27 August 2015 are covered. 1.GSLV-D6 successfully launched.GSLV-D6 is a cryogenic upper stage cryogenic three stage heavy weight rocket. ISRO(Indian Space Research Organization) successfully put in orbit GSAT-6 communication satellite. 2.GSAT-6 Communication Satellite is aimed at primarily benefiting the country's strategic users and other specific authorized users.his satellite contains the largest antenna ISRO has ever made for a satellite. 3.Dr B R Ambedkar,Dalit icon and architect of Indian Constitution lived as a student in the 1920s at 10 King Henry's Road in north west London.India sealed the deal to acquire the ownership of a three-storey bungalow. The house will be turned into an educational and cultural centre (According to sources). American Society for Metals this year for their contributions in the fields of Materials Science and Engineering. 5.Noted Indian Scientist Dr Modaduru Vijay Gupta who has pioneering work in aquaculture in India,Bangladesh and several other countries was awarded the first Sunhak Peace Prize(He shared with the President of Kiribati Islands). 6.Usain Bolt won another sprint double by defeating his American rival Justin Gatlin to retain his world 200 metres title at Bird's Nest Stadium in Beijing, China. 7.American Allyson Felix won gold medal in Women's 400 metres at IAAF World Championships, Beijing 2015. 8.The Government of India released the list of 98 Cities which include 24 state capitals which are to be developed as smart cities.